If you have teenagers in your house, you’ve probably noticed how difficult it is to separate them from their smartphones and the Internet. From Facebooking to Instagramming to just talking with friends, it can seem like their entire lives are going digital. But just how connected are they really? A new study by the Pew Research Center for Internet, Science and Tech tells all, showing exactly how much the average U.S. teen uses technology to stay connected with the world. When it comes to the Internet in general, it should come as no surprise that virtually every teenager – 98 percent – uses it at least once a week; 92% use it at least once a day. Of course, the advent of smartphones makes it even easier to use the net even more frequently than that. Over half of all teens (56%) report using the Internet “several times a day,” while one in four (24%) report using the Internet “almost constantly.” Teens from wealthier families are more likely to spend time online than their less well off peers; African-American and Hispanic teens use the web more frequently than white teens do. So what, exactly, are teens doing with their phones that they need to be online several times a day at the very least? The study shows that texting and messaging apps are big – a typical teenager sends and receives 30 messages a day, with girls texting about twice as much as boys. The survey shows that a third of teens (33%) use mobile messaging apps like WhatsApp or Kik to chat; approximately half (47%) use video chat apps like FaceTime. Predictably, social networking is big amongst teens as well. A full 76% of teens report using social networking sites, with Facebook being the most popular – 71% of teens report using it and having an average of 145 friends on the site. Instagram is popular as well, used by over half (52%) of all teenagers. Ephemeral chat app Snapchat is used by 41% of teens, while just 33% report using Twitter and Google+. Only 24% of American teens use video app Vine. With the exception of Facebook, it appears that girls are more likely to be involved in social media sites than boys are. There’s nothing inherently wrong with any of this, of course. 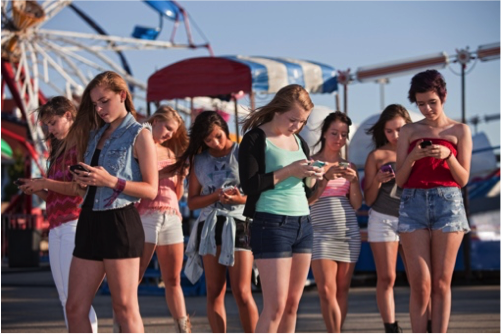 Teenagers have always been social creatures; technology is simply changing the way they interact with each other. That said, it’s important for parents to understand how their teens are using smartphone technology and to set basic rules. It’s fair to set time limits or designate “no texting hours” for homework, family time and other responsibilities. Make sure teens understand the consequences of sharing compromising information or pictures – nothing shared online is private, even over a self-deleting message app like SnapChat. You should also talk to your teen about online bullying, a growing and oft devastating problem. For more on the Pew Research Center survey, including crosstabs and other demographic information, visit the organization’s website.